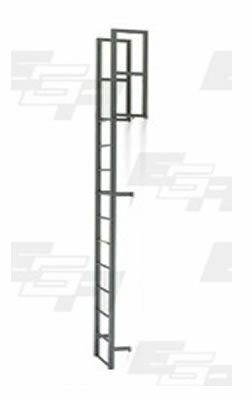 EGA Products 10 Step Steel Vertical Walk-through Ladders are ideal for vertical access to water tanks, building roofs, elevated platforms where a ladder can be flat-mounted vertically. Walk-through handrails extend 42" above top rung offering safe access on and off the ladder. Constructed from 1 1/2" steel tubing, these ladders are durable and tough. Rungs are 1" diameter. Meets or exceeds OSHA specifications. Comments: I bought this ladder. Perfect for my application. They kept me informed of my lead time and ship date. Great transaction with Dock Ladders Depot!